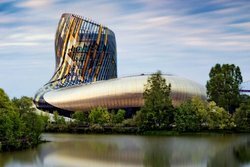 Are you planning to visit Bordeaux? Invisible Bordeaux is all about scraping beneath the surface of the city and uncovering the lesser-known places and stories that Bordeaux has to offer. However, by popular demand, here is a thumbnail guide to the more postcard-friendly sights that you are expected to take in during a stay in the city, all of which you can easily locate on this dedicated map. Many of the sights also feature as stops on the walking tours which are available as free PDF downloads by clicking here. So, enjoy your stay! Place de la Bourse: This square took shape between 1730 and 1755. A statue of Louis XV on horseback stood in the centre of the square, first known as Place Royale, until 1792. Since 1869, the Fountain of the Three Graces has been the focal point of Place de la Bourse. It represents the three daughters of the god Zeus and Euronyme: the goddesses of Grace, Beauty and Mirth (Aglaia, Euphrosyne and Thaleia). The building on the northern flank of the square first housed the Palais de la Bourse commodities exchange and is now home to the Bordeaux chamber of trade and industry. The southern flank was the Hôtel des Fermes customs and excise bureau. Customs and duties offices are still located there, as well as the national Customs museum. Miroir d’Eau: The complex computerised water circuits of the Miroir d’Eau, the water mirror, were switched on for the first time in October 2006. The design of this surprising attraction was the work of the landscape architect Michel Corajoud and the water technician Jean-Max Llorca. The concept was inspired by visions of a waterlogged Piazza San Marco in Venice. The full feature is 130 metres long and 42 metres wide. Winter periods aside, 3,450 square metres of granite slabs are covered with water that moves and almost breathes according to a pre-defined sequence, switching from a 2-centimetre deep paddling pool to a sea of spray and mist. The 900 injectors are fed by an 800-cubic-metre underground tank. Grand Théâtre: This monumental building was the work of the architect Victor Louis and was erected between 1773 and 1780. Watching over proceedings at all times are twelve statues, each perched in line with a Corinthian column. They represent the nine muses and the goddesses Juno, Venus and Minerva. The inside of the building, which can only be viewed when on a guided tour organised by the Office de Tourisme or when attending a show, is equally impressive, with grand stone staircases leading to the five tiers of seating in the main performance hall, which is topped off by a painted ceiling and an elaborate chandelier. Esplanade des Quinconces and Monument aux Girondins: The Esplanade des Quinconces is often the scene of funfairs, circuses, specialist markets and concerts. The square only took its present form in the 19th century. Until its demolition in 1818 it was here that a fortified castle, Château Trompette, had kept watch over the city for more than 300 years. At one end of the square are two 21-metre-high rostral columns which were erected in 1829. They respectively symbolise trade and navigation. At the other end is the spectacular “Monument aux Girondins”, which pays homage to the Girondins political group who were overpowered and executed by their rivals the Jacobins in the slipstream of the French Revolution. Porte Cailhau: This fortified gate into the medieval incarnation of Bordeaux was erected in 1495 and its sculptures pay tribute to King Charles VIII, who had recently conquered the kingdom of Naples in the company of Cardinal d'Epernay, Archbishop of Bordeaux. When the gate was built, the river bank stretched all the way up to the fortifications of the city. The walls may no longer be there but the rough edges on either side of the gate serve as a reminder of where they used to be, as do the paving stones inserted in between the cobbles on the ground. There are many interesting details to spot, such as the slot where a sliding portcullis used to be, the machicolations through which weapons could be dropped on attackers, and the lookout tower which served to patrol the river. Porte Saint-Éloi and the Grosse Cloche: The 13th-century Porte Saint-Éloi was one of the gates to the heart of the city and a natural extension to the existing Saint-Éloi church. It was also known as Porte Saint-James as it welcomed a steady stream of St. James' Way pilgrims. The Grosse Cloche (Great Bell) belfry was added in the 15th century and has become one of the best-known landmarks in Bordeaux, visible on the city’s coat of arms. The current bell was installed in the 18th century. Cast in 1775, it weighs 7,800 kilograms and is two metres tall and wide. Tour Pey-Berland and Cathédrale Saint-André: From the top of the 66-metre-tall Pey-Berland belfry, visitors can take in one of the best views of the “Port de la Lune” (as Bordeaux is also known, the shape of the river Garonne being that of a lunar crescent as it flows through the city), as well as getting a closer look at the virgin mother and child, who are facing the direction of the Médoc wine-growing region and the birthplace of the 15th-century Archbishop of Bordeaux, Pey Berland. Neighbouring Saint-André cathedral and its twin spires were built between the 12th and 16th centuries and formed the backdrop to two royal weddings: that of Aliénor d’Aquitaine and the future king Louis VII in 1137, and that of Louis XIII and Anne of Austria in 1615. The scale of the church is awe-inspiring, with a 23-metre-tall nave that stretches over 124 metres. Pont de Pierre: The Pont de Pierre bridge over the Garonne was the sole means of crossing the river within the city from its completion in 1822 until the Pont Saint-Jean and Pont d’Aquitaine were opened in 1965 and 1967 respectively. Its construction had been commissioned by Emperor Napoleon Bonaparte, and medallions celebrating his rule feature on each flank while the number of arches (17) echoes the number of letters in his name. Pont Jacques-Chaban-Delmas: Pont Chaban-Delmas, also affectionately known to some as Pont Chababa (Chaban-Bacalan-Bastide) in reference to the two districts it connects, is Europe’s largest lift bridge. Inaugurated in March 2013 after four years’ construction work, the structure is 425 metres long and its four pillars measure 76 metres. The 117-metre central lift span, which weighs around 2,600 tons, rises vertically to a height of 55 metres to let tall ships pass underneath. 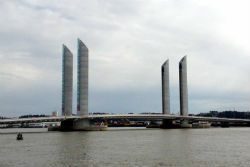 The €160m bridge, mainly funded by the greater Bordeaux authority (Communauté Urbaine de Bordeaux), was designed by architects Charles Lavigne, Thomas Lavigne and Christophe Cheron in association with the engineer Michel Virlogeux. Place du Parlement: It is in the 1760s that Place du Parlement was remodelled as part of the urban designs of the Marquis de Tourny. At the time it was known as Place du Marché Royal, and traces of its former name can still be seen on some walls. Around the time of the French Revolution it became Place du Marché de la Liberté, ahead of being given its current name in the 19th century. The square’s beauty lies in the harmonious nature of its flanks, with the exception of a single building which stands taller than the others. The fountain in the middle of the square was designed by Louis Garros and has been in position since 1865. Palais Gallien: This Gallo-Roman amphitheatre was built in the 2nd or 3rd century and its wooden stands could hold 15,000 spectators (some say up to 22,000). At the time it would have been located outside the city, which has made substantial headway in the intervening years! Experts have established that the arena section measured 70 by 47 metres. On the outside, the structure was 132 metres long, 111 metres wide and 25 metres tall. Much of the coliseum survived until the time of the French Revolution (1789), prior to which it was a haven for criminals and prostitutes, then a rubbish tip! In 1800, authorities stepped in before the remaining western wing was also torn down and in 1911 the ruins were officially listed as national heritage. Rue Sainte-Catherine: This 1,250-metre-long street is the vibrant commercial heart of the city. It is often referred to as the longest shopping street in Europe, and there are more than 250 shops to choose from. The street has been fully pedestrianised since 1984 and was totally overhauled between 2000 and 2003. The street’s name is in reference to a chapel which stood until 1835 on the spot where a FNAC store can now be found. Place Gambetta and Porte Dijeaux: Place Gambetta has undergone many name changes. When the space was first cleared in 1770, it started out as Place Dauphine, in homage to the King’s son, the “dauphin”. It became Place Nationale shortly after the French Revolution before reverting back to its previous name until 1883 and its switch to Place Gambetta, as a tribute to the 19th-century politician Léon Gambetta. The central part of the square provides some welcome greenery. But, between October 1793 and July 1794, it is here that the city of Bordeaux installed its guillotine – around 250 public executions took place. Porte Dijeaux is a decorative gate into the heart of the city that was erected in 1748 to the designs of Nicolas Portier on the spot where one of the Roman-period gates once stood. The city’s coat of arms features on one side of the arch, just above the sculpted face of Neptune, looking down towards the river Garonne. Cours de l’Intendance: Cours de l’Intendance forms the southern flank of the affluent so-called Triangle d’Or quarter (the golden triangle), the other two sides of which are formed by Cours Clémenceau and Allées de Tourny. In past centuries, the mansion houses of many of the city’s richest families were on this street. At number 57, now the Cervantes Institute Spanish cultural centre, the Spanish artist Francisco Goya spent the last months of his life. Goya died there in 1828 at the age of 82. Place des Grands Hommes: Place des Grands Hommes is at the heart of the Triangle d’Or. This wealthy quarter is a showcase for luxury shops and elegant architecture. A traditional covered food market was the focal point of Place des Grands Hommes for many years. In 1958, the market hall was torn down and replaced by a concrete structure. Thirty years passed and it was time for another change, and today’s glass-and-metal arcade was officially opened. Place du Marché des Chartrons: It was in the mid-19th century that chief city architect Charles Buguet led the construction of a permanent octagonal covered market structure surrounded by a covered walkway, the glass roof of which was supported by elegant metallic pillars. The covered market, known as la Halle des Chartrons, remained largely unchanged until the 1950s, when the decision was made to enclose the entire structure within opaque concrete walls. In 1998, the concrete walls came down and the structure regained its original appearance with the central building and the covered perimeter walkways. It is now a cultural centre that puts on a wide range of exhibitions, meetings, debates and concerts. Jardin Public: This wide expanse of greenery in central Bordeaux was a formal “jardin à la française” upon its creation in the mid-18th century. After the French Revolution, the grounds officially became a “Jardin Public” that was open to all-comers. In the 19th century much of its formal design was dropped in favour of a more free-form British style, a “jardin à l’anglaise”. As well as being ideal for a gentle bird-, tree- and statue-spotting stroll, the Jardin Public provides a number of distractions including a merry-go-round, puppet shows and a café. Since 1858, botanic gardens have also been carefully tended to within the grounds of the Jardin Public, with another branch being opened in the right bank Bastide neighbourhood in 2001. The gardens are also home to a natural history museum which is undergoing refurbishment work. It will re-open in 2014. Saint-Michel church: This flamboyant gothic church was built between the 14th and 17th centuries. Again, the belfry stands apart from the main edifice (as with Saint-André, the instability of the Bordeaux soil was the reason behind this decision). The “Flèche de Saint-Michel”, as it is known, tops out at 114 metres! Place de la Victoire: I f you needed any reminder that Bordeaux is a lively student city, Place de la Victoire is the best place to start. Surrounded by popular bars, the square is a public transport hub and meeting point for the more youthful Bordelais population! Since 2005, its centrepieces have been the red marble obelisk and bronze tortoises created by Czech artist Ivan Theimer. Predating them by more than 250 years is the decorative Porte d’Aquitaine gate into the city, built by architect André Portier in 1753. Beyond the arch is the Rue Sainte-Catherine pedestrianised shopping street (see above). The square was previously known as Place Saint-Julien and was given its current name in December 1918 to commemorate victory in the First World War. Saint-Seurin Basilica: Saint-Seurin basilica was originally built in the 6th century then overhauled and extended between the 12th and 14th centuries. It was (and still is!) the first stop in Bordeaux for St. James' Way pilgrims passing through the city en route to Santiago de Compostela, in north-western Spain. The church boasts some fine samples of Christian carvings and sculptures, and an impressive pipe organ which was first installed in 1776. In the early years of the 20th century, archaeological digs uncovered a large Christian cemetery with graves dating from the 4th to the 18th centuries, and revealed a set of walls that formed constructions from different periods housing fresco-decorated tombs and pottery storage jars that were used to bury infants. Place Stalingrad: The most striking feature of this square is the large blue lion conceived by the French artist Xavier Veilhan (born 1963). It has been in position since 2005 and has become one of the symbols of the renewal of this district, which was for many years regarded as the black sheep of the Bordeaux neighbourhoods. The plinth-less statue, made from composite materials (polystyrene, polyester resin on a metallic frame), is very much of its times: computer software played a large part in getting the geometrically-challenging volumes just right! Botanic Gardens: These right-bank gardens were conceived in 2002 – nearly 150 years after their left-bank Jardin Public counterparts – by the landscape gardener Catherine Mosbach and the architect Françoise-Hélène Jourda. The gardens, which opened in 2004, feature a number of zones which each reflect a different type of landscape of south-western France. The most impressive features include a wide expanse of water which provides a home for numerous aquatic species, and the glasshouse conservatory (and exhibition centre) where 500 types of Mediterranean plants are kept. Other more unusual sights which could prove rewarding - and which have been covered on the blog - include: la Base Sous-Marine WW2 submarine pen, the Mériadeck quarter, Statue of Liberty, Cour Mably, the façades of Hôtel Saint-François, Place Fernand-Lafargue, Pont d'Aquitaine, Rue des Bahutiers, Impasse de Rue-Neuve, Caserne des Pompiers de la Benauge, Toussaint Louverture statue, Place Georges de Porto-Riche, Stade Chaban-Delmas and Parc Floral. Enjoy!